In the efforts presented by Curry, expanding the error range of the models to explain away the divergence between warming from model projections and observations may be a temporary quick-fix but it is far from satisfactory. One issue the method raises is that if the observations continue to show no warming trend, then the error range would have to be increased in the future – to the point of showing a possible global cool? Tropical Sea Surface Temperatures: On his blog Roy Spencer, the other co-developer of the satellite temperature record, addresses the issue of tropical sea surface temperature trends as measured by the Tropical Rain Measuring Mission (TRMM) Microwave Imager (TMI), which went into operation in 1998. The measurements show no warming. Even after calculating the effects of El Nino and La Nina activity, the measured trend is one-third of that predicted in the models. The failure of the tropical sea surface to warm as models project may give the Climate Establishment further consternation in preparing the IPCC AR5. Please see link under Challenging the Orthodoxy. Energy of Hurricanes: The web site of the US National Oceanic and Atmospheric Administration (NOAA) posts a question: how much energy does a hurricane release? The posted answer is providedby Chris Landsea who calculates that for the average hurricane the energy released from the condensation of water vapor to form clouds and rain is about equivalent to 200 times the total world-wide electrical generating capacity, for each day. Only about one part in four hundred of this energy release drives the swirling winds that are associated with the hurricane. Five time IPCC expert reviewer Vincent Gray takes these calculations a bit further. He compares the average energy loss over a year for an average of eleven hurricanes lasting one week with the heat from a supposedly increase in warming from the enhanced greenhouse since 1750. [His calculations do not include energy release from other cyclones, thunderstorms, etc.] Gray concludes that hurricanes, alone, “conceal any possible much smaller effects of greenhouse gases which could never be identified. The models are not only wrong. They are irrelevant.” [Boldface added] See link under Changing Weather. Feel-Good Legislation: Leaders of several Western European nations are beginning to feel the anger of the general population for requiring wind and solar power in place of traditional sources of electricity. Wind and solar are more costly and unreliable sources of electricity. Thus they require duplication by traditional sources. One example of this feel good legislation is the UK’s Climate Change Act of 2008 which requires reductions in carbon dioxide emissions over a series of five year periods. As coal-fired power plants are being squeezed out, electricity rates are increasing significantly. For some time, the politicians who advocated for the legislation have acted in typical political fashion – evade and obfuscate any responsibility. This week Alastair Buchanan, the outgoing head of Britain’s regulator of electricity and natural gas, Ofgen, announced that with the retirement of coal and nuclear plants there may be a significant gap between the ability of the nation to generate electricity as compared with its consumption and that electricity prices may go significantly higher. 1. Energy should be obtained from a variety of sources, lest one should fail. 2. There should be a reliable and continuous source to service the base load. 3. There should be further instantly available sources to accommodate demand surges. 4. Unpredictable and intermittent sources should be avoided. 5. Policy should not be decided by trends, fashions or religious convictions. Following the fad of “dangerous global warming,” the politicians have squandered huge sums of money on unpredictable and intermittent sources such as wind and solar. Some have maintained that if the wind farms are geographically separated, then wind could provide base load. As discussed in last week’s TWTW, the study of the Eastern Australian Grid, with wind farms that are geographically separated over broad distances, shows the concept is completely false. The wind farm system frequently failed to meet the extremely low level of performance of two percent of installed capacity. There is no justification to continue to believe that wind power can be reliable, if enough capacity is installed. Given the unreliability of wind, it is doubly false to claim domestic wind is a secure energy source. Please see links under Questioning the Orthodoxy and Questioning European Green. Washington’s Energy Plan: A number of commentators have expressed their views of the administration’s energy plan, largely from what President Obama stated in his Inauguration Speech. Marita Noon takes an unusual approach. She examines the document prepared for the speech and what appears to be the underlying foundation for the president’s plan. A major failing contained in these documents is the false belief that energy efficiency of doing more work with less energy can be achieved by government mandates. If the simple goal is to reduce energy use, then the simple solution is to do no work. The most effective way of achieving energy efficiency is by people and organizations trying to cut energy costs in imaginative ways. If one believes that one of the keys to prosperity is reliable and affordable energy, the future under the energy plan is not promising. The country may be following the bleak future that Western European politicians are laying out for their countries. A Bold, New, International Plan: The prerelease of an upcoming article by some American scientists contains disturbing elements that claim the need to modify human behavior in order to save humanity. Of course, all this would be done under the auspices of the UN and its enlightened scientists as found in the IPCC and in the New Millennium Project. Since the concepts are not fleshed out, perhaps TWTW is overreacting. But one of the authors of the plan is Paul Ehrlich, author of the Population Bomb. In a separate article he states that odds of sustaining human civilization under the current conditions are 10% or less. He uses this and similar questionable arguments to try to justify centralized control. In the view of TWTW, if human civilization is to fall, the fall will be brought on by the likes of Paul Ehrlich and his appeal for misanthropic, authoritarian organizations. Amplifications and Corrections: In commenting on the failure of government agencies to assure that rigorous science is performed under scientific grants, Stan Young states that one of the big issues is the failure to require that all data be provided for public scrutiny if a study uses federal funds. On March 5, the House Science Research Subcommittee will hold a hearing on Scientific Integrity and Data Transparency. It will be interesting to see if many of the nation’s independent scientific institutions will publically support such action. Number of the Week: Over $30 Billion. According to estimates by the Wall Street Journal, BP has committed or paid over $30 Billion in oil spill cleanup, fines, and settlements, thus far. It faces additional billions in liabilities for violations of the Clean Water Act. No wonder the UK’s Daily Mail has called for the administration to stop unnecessary punishment of this British company, calling it a brutal vendetta against Britain. Oh, for the day when electric-car enthusiasts didn’t expect the rest of us to subsidize their hobby. Who’s muzzling whom over what? Will less ice be good or bad for Arctic ecosystems? Scientists discuss. Reference: Vuille, M., Burns, S.J., Taylor, B.L., Cruz, F.W., Bird, B.W., Abbott, M.B., Kanner, L.C., Cheng, H. and Novello, V.F. 2012. A review of the South American monsoon history as recorded in stable isotopic proxies over the past two millennia. Climate of the Past 8: 1309-1321. Reference: Vanuytrecht, E., Raes, D., Willems, P. and Geerts, S. 2012. Quantifying field-scale effects of elevated carbon dioxide concentration on crops. Climate Research 54: 35-47. Reference: Rhodes, R.H., Bertler, N.A.N., Baker, J.A., Steen-Larsen, H.C., Sneed, S.B., Morgenstern, U. and Johnsen, S.J. 2012. Little Ice Age climate and oceanic conditions of the Ross Sea, Antarctica from a coastal ice core record. Climate of the Past 8: 1223-1238. Reference: Gu, Y., Wang, H., Huang, X., Peng, H. and Huang, J. 2012. Phytolith records of the climate change since the past 15000 years in the middle reach of the Yangtze River in China. Frontiers of Earth Science 6: 10-17. Enviros team up with the feds to drive out ranchers and create a vast eco-theme park. Who ­monitors the oil sands monitors? Link to Study: Carl Johnston, Lewis Warne and H. Sterling Burnett, “Coal: Beginning the Long Goodbye?” National Center for Policy Analysis, Feb. 19, 2013. A tiny startup called Ambri wants to transform our energy system with massive liquid-metal batteries. Unable to locate link to article. Can Commercial Space Rescue NASA From Deadly Public Indifference? Global Warming believers March in D.C. Your summaries are excellent. Thanks. I’ve met Christine Lagarde, been personally introduced to her (not that she would remember me), and have heard her speak in person, which she typically does with both quick wit and good humor. That was when she was in the private sector before she became managing director of the IMF. It pains me to see this quote from her. What could possess her to say such a ridiculous thing is baffling. I’m afraid the layers of lobbyists and “expert advisors” in government and quasi-government organizations, coupled with privileged isolation, eventually take their toll on a person’s grasp of reality . . .
Maybe she’s in fact as dumb as a box of Eurocommissars; and you didn’t notice. THe alternative would be that she’s lying and has a vested interest in promoting the fall of Europe. Part of the AGW dysfunction is that people who should act as trusted advisers have become radicalized into AGW extremists and promoters and are feeding decision makers a lot of climate hype instead of good advice. We end up with an EPA workers acting duplicitously with NGOs to enrich them (and themselves, thanks to revolving doors) with fat carve outs. We end up with scientific advisers pushing ridiculous lose-lose policies that only enrich climate insiders at the expense of rate payers and tax payers (Think of the damage climate kooks are doing to the British power grid). The Sun is quiet. This means less heat input to the tropics [equator region]. I don’t care what the Solar constants [TSI dogmatists] say. 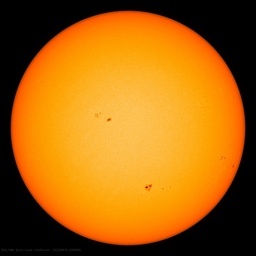 Note: to answer their objections, the Solar UV is at a minimum [range ~70 to 300, 10.7cm flux units] of less than 100 flux units. Solar UV drives the Ozone regions controlling the Ozone layer height. The height of the Ozone layer effects the amount of atmospheric insulation. a) The Jet Streams will move toward the Equator causing later springs and cooler temperatures. b) The Jet Streams will bring more cold air clashes [moving toward the Equator] with the heat/moisture from the Oceans/Sun moving toward the Poles [stored heat, less Solar energy]. c) Not necessarily stronger storms, but more rain/snow closer to the equator. d) Of course, the regions nearer the Poles will also get more snow/rain and less melting. Just remember, the same illustrious scientists that said Solar Physics is settled, missed this Solar cycle peak projection six times. Let’s see if they can get the data right after this Solar cycle  is over. I would expect grand manipulation!